The most highly-anticipated fight of the year is official for UFC 229, which goes down this Saturday night at T-Mobile Arena in Las Vegas, Nevada. 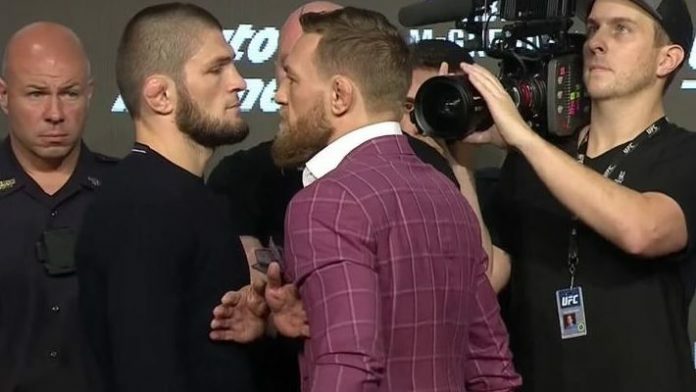 UFC lightweight champion Khabib Nurmagomedov and former champ Conor McGregor were both on championship weight Friday afternoon and we are going to get a title fight. The UFC is projecting the event to do record pay-per-view numbers, and it’s on the strength of this tremendous main event between the two best lightweight fighters in the world, a fight that has epic potential. It’s rare to actually see the two best fighters in a weight class compete at the top of their games, but this Saturday night at UFC 229 we get to see it. Nurmagomedov is a perfect 26-0 in his MMA career including a pristine 10-0 record in the UFC. He has pretty much dominated every single fighter he’s come across and has beaten to a pulp high-quality opponents like Rafael dos Anjos, Edson Barboza, and Michael Johnson. In his last fight, Nurmagomedov won the vacant lightweight title with a decision win over Al Iaquinta at UFC 223. At age 30, Nurmagomedov is in his physical prime and now that he’s gotten his weight in check he could be unstoppable in the lightweight division. He is the most dominant grappler the sport has ever seen at 155lbs, and his wrestling combined with his ferocious ground-and-pound, submission ability and pace make him feared by everyone. Everyone except for McGregor, that is. The former UFC lightweight and featherweight champion is making his return to the Octagon after almost two years outside of it, but it’s not like he has just been sitting idly on the sidelines. Ever the businessman, McGregor took a break from MMA at the height of his career last summer to fight Floyd Mayweather in one of the biggest-selling boxing matches of all time, and since then has launched numerous business including his best-selling whiskey drink Proper 12. He doesn’t even have to fight in MMA anymore if he doesn’t want to, because he’s already rich. But he loves fighting, it’s in his blood, and he wants his belt back. McGregor is 9-1 overall in the UFC and at age 30 is right in his prime. Outside of his shocking loss to Nate Diaz in early 2016, no one has been able to even touch him inside the Octagon. He’s shown time and time again the dynamite he possesses in his hands — just ask Jose Aldo, Eddie Alvarez, and Dustin Poirier about those hands — and combined with his mental smarts, outrageous personality and unwavering confidence, he’s one of the most impressive fighters MMA has ever seen. To get this fight between two of the best fighters in the world in their physical prime is an absolute treat for MMA fans, who haven’t seen McGregor compete in two years, and who have struggled along with Nurmagomedov as he’s suffered numerous setbacks the last few years with injuries and bad weight cuts. It’s a fight that MMA fans deserve to see, and it’s finally happening this Saturday. It’s the ultimate clash of styles between the most dominant grappler the lightweight division has ever seen against the most devastating striker the division has ever seen. And both guys absolutely despise each other. When you think about the best matchups that could possibly be made in MMA, this fight between Nurmagomedov and McGregor is one of them. Two of the best fighters in the world are healthy, on weight, and ready to throw down. You don’t want to miss this one, because it could be one of the best fights we’ll ever see, and it makes UFC 229 a must-watch event. Who do you think wins, Khabib Nurmagomedov or Conor McGregor? Leave your pick below in a comment.